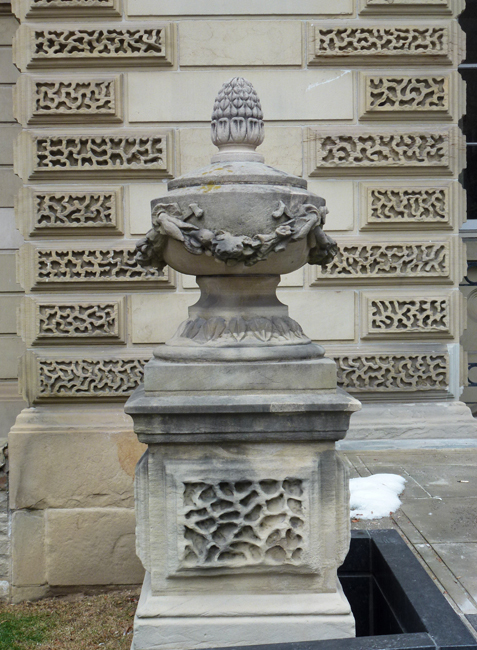 This is one of the urns found at the entrance to the centre wing of Osgoode Hall which is the home of the Law Society of Ontario on Queen St Beside our City Hall. I love the background of the textured wall of the hall. You photographed and composed this beautifully and lest we forget, there is that little patch of snow for a taste of reality! When I first glanced at the thumbnail, I read "Um," instead of "Urn." Maybe I need new glasses? But urn is good; Lois can put my ashes in there when I go if the Law Society wouldn't mind. You did notice the texture of the urn matches the texture of the wall. ...the carved stone is wonderful. I have never been a big fan of urns, but I love the wall behind this one! This is beautiful especially with that wall behind it. That wall is very interesting. It is pretty! I like seeing that little bit of snow behind it. That building is one of the loveliest in Toronto. Terrific details in this shot! Nicely composed photo and I like the details. Osgoode Hall has urns? Thanks for teaching me something new. Beautiful urn and lovely hall. A beautifully composed photo and I love the details. Nice shot, Pat. Hmmm, are someone's ashes in that urn? Or is it only decorative. Beautiful designs on the urn.